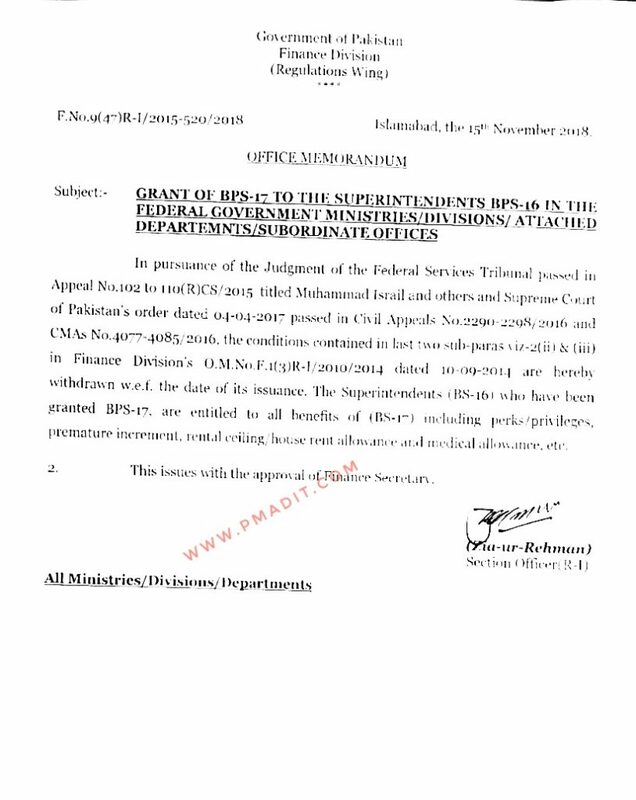 In pursuance of the Judgment of the Federal Services Tribunal passed in Appeal Mps 102 to 110®CS/2015 titled Muhammad Israil and others and Supreme Court of Pakistan’s order dated 04-04-2017 passed in Civil Appeal Nos 2290-2298/2016 and CMAs No. 4077-4085/2016, the conditions contained in last two sub-paras viz-2(ii) & (iii) in Finance Division O.M. dated 10-09-2014 are hereby withdrawn w.e.f the date of its issuance. The Superintendents (BS-16) who have been granted BPS-17, are entitled to all benefits of (BPS-17) including perks/privileges, premature increment, rental ceiling/house rent allowance and medical allowance, etc. Special Thanks to Mr. Muhammad Iqbal Awan, Finance Division (Military), HIT Taxila for providing a very useful O.M.